Fruit juices offer a flavorful change from water and a caffeine-free alternative to coffee and tea. The natural sweetness of many juices adds to their appeal. Pure fruit juices also provide a variety of valuable nutrients, including vitamin C, potassium and some B vitamins. While fruit juices are best used in moderation, some can help you increase your iron intake. An 8 ounce serving of pineapple juice provides 0.78 milligrams of iron, and the same serving size of grape juice contains 0.63 milligrams, according to the USDA Nutrient Data Laboratory. Both orange and pomegranate juices have only 0.25 milligrams of iron per 8 ounce serving, while that amount of grapefruit juice offers a tiny 0.06 milligrams. Prune juice is one of the best juices for iron. This juice contains 3.0 milligrams iron per 8 ounce serving. Although you may not think of tomato juice as fruit juice, the tomato is technically a berry and is also rich in iron. An 8 ounce serving of this juice provides 1.05 milligrams of iron. Because whole apricots and peaches are also relatively rich in iron, juices from these fruits also supply small amounts of iron. Other moderate climate fruit juices contain very little of this mineral. Apple juice gives you 0.30 milligrams per 8 ounce serving, while pear juice contains no significant amount of iron. Sufficient dietary iron is critical for the blood's ability to carry oxygen to the cells. In moderate quantities, fruit juices provide a quick, palatable way to boost your iron intake. Juices from citrus fruits, such as oranges and grapefruit, don't contain much iron, however, they are rich in vitamin C which improves iron absorption. Men ages 19 to 50 need 8 milligrams of iron daily, while women need 18 milligrams, advise health experts from the University of Maryland. That means for men an 8 ounce serving of iron-rich prune juice provides 37 percent of the recommended daily iron intake for men and 16 percent for women. Because fruit juices are often high in sugar and low in nutrients, the 2010 Dietary Guidelines recommend limiting your juice intake to less than 4 ounces daily. In addition to drinking fruit juices, you can also use juice to flavor iron-enriched hot or cold cereals which will increase the iron you absorb from them. For nutrition, 100 percent juices are better choices than fruit-flavored drinks, which may not contain real juice. 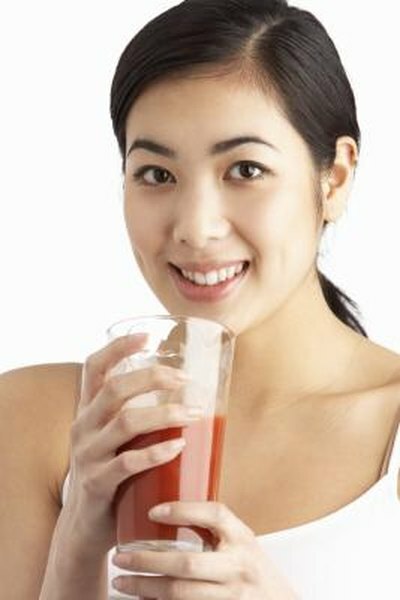 Iron content in 100 percent juices and juice blends varies, and some commercially available juices contain added iron. Check the nutrition facts label on the package to determine exactly how much iron a particular juice product contains. To get the most iron, avoid mixing juice with tea because the tannin in tea interferes with iron absorption.